Graceful and athletic animals. Seals are skillful swimmers and divers. Some seals swim up rivers, and a few are found only in freshwater lakes. Probably the best-known seal species is the Californian sea lion, which is often trained to perform tricks. Graceful and athletic animals that can be trained to perform a number of actions through operant conditioning. Seals make the taxonomic group of animals called the Pinnipeds. 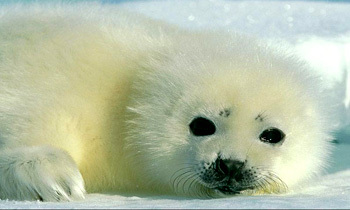 seals are meat–eating mammals found in all oceans of the world, but most abundant in Arctic and Antarctic waters. Some seals swim up rivers, and a few are found only in freshwater lakes. 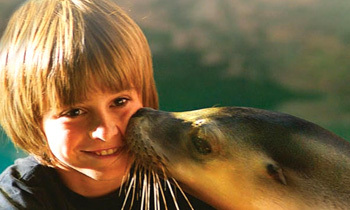 Probably the best–known seal species is the Californian sea lion, which is often trained to perform tricks. It is the species most often found in zoos. Some species of seals are hunted commercially – more for their blubber (fat) and pelts than for their flesh. The fur of some species is popular for fashionable wearing apparel; the hide of other species is used for leather. Oil rendered from the blubber goes mainly into soap. Seals can reach speeds of about 12 mph, but usually go much more slowly. Their blubber helps to streamline their bodies. Sea lions can swim about 13.5 mph. Seals often swim upside–down, which may help them to search for prey in deeper waters. Seals are semi–aquatic mammals with a sleek, barrel–like body and fins. With their big, brown eyes and appealing dog-like faces, seals are attractive creatures. They live all over the world, from the frozen wastes of the polar regions, to the tropical beaches. 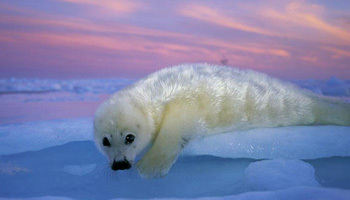 Seals are warm–blooded animals i.e, their body temperature remains constant regardless of the outside temperature. All seals have a layer of blubber under the skin that acts as an insulator against the cold. Sea lions, which are generally found in warmer climates than other seals, have little additional protection. Earless seals, on the other hand, have a circulatory system that limits the quantity of blood that flows through the skin and thus reduces the amount of body heat lost from the skin. 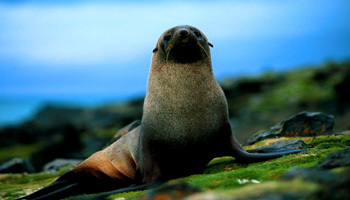 The fur seals, in addition to blubber, have a two–layer covering of fur. The upper layer consists of coarse guard hairs; the dense lower layer is made up of short, fine hairs and acts as an additional insulator. Seals have large, roundish eyes that in some species are huge in proportion to the size of the skull. The eyes have thick, spherical lenses that enable the seals to see well under water. Unlike most other mammals, seals do not have tear ducts. Thus when seals are observed on land they look as though they are crying because their tears run out of the eye onto the face. Seals have rather long whiskers around the mouth. Seals have flippers instead of hands and feet, and they can dive for up to an hour to depths of more than 200m and even down to 500m without surfacing for breath. Seals can bring their whiskers forward when they need to feel for fish in the darkness of deep or murky waters. A seal&apos;s sensitive whiskers can feel the slight changes in water currents around them when fish are swimming in schools. Adult seals weigh from about 130 pounds (60 kg) to more than 8,000 pounds (3,600 kg), depending on the species and individual. The lifespan of some species is up to 40 years. Seals vary in color depending on the species, and sometimes members of the same species have different coloration. In general, they are brownish or grayish, often with various shadings, blotches, or stripes. Seals have been trained to understand short sentences and to perform in circuses and zoos. Seals are clever and intelligent animals and this makes them easy to train (like the dolphins). Seals respond best to positive training rather than punishment. They can be best trained through a process called operant conditioning, which involves a number of basic steps. Essentially an action must be observed, a cue must be developed for that action and the action must then be rewarded. This type of training can be used for virtually any trick you want the seal to learn. By training them, the management of these animals in captivity becomes much easier, safer, more educational and keeps the seal's mind active. Seals are popular in many cultures. They are often featured as entertainment in zoos and water parks as well as on TV and in movies. 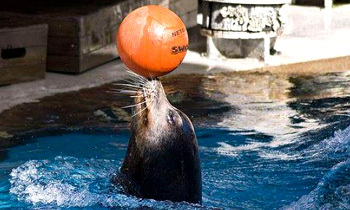 Seals are smart, and can learn to perform many tricks. Because of their great popularity in zoos and culture, people may not realize how many seal populations are threatened by hunting and habitat destruction. Marine mammals like seals, sea lions, whales and dolphins have a number of interesting natural behaviors and skills which generate curiosity in people. While visiting zoos and aquariums, most enjoy watching these animals perform behaviors while interacting with the trainers. Positive reinforcement modern animal training really started developing over the past 60 years. It has led to today&apos;s training techniques in which the animals cooperate in their own care and demonstrate their natural behaviors to the visitors. Today&apos;s training is based on operant conditioning, where the seals change their behaviors because of positive reinforcement, making them most likely to repeat the action when asked. With the seals we use a variety of reinforcements, although a fish snack is the most popular. Trainers also provide toys and even gelatine cut into cubes. When a seal follows a request it&apos;s rewarded with a fish. If the seal doesn&apos;t do what the trainers ask, they will give it a few seconds and then try again. Reinforcing the animals cooperation is the key to successful training. 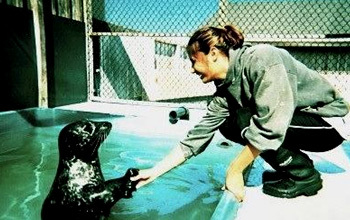 The seals quickly learn every time the trainer rewards them Animals, like people, learn at different rates, and there is no set time for learning and training certain behaviors. One thing that helps trainers teach animals is discovering what an animal finds reinforcing. A reinforce is anything that increases the frequency of behavior. We can also employ a few training tools that make the job easier, the main one being the whistle you see around a trainer&apos;s neck. When we first start training seals, we pair the sound of the whistle with fish. So each time they get a fish they hear the whistle and soon begin to realize that the whistle means a good thing is coming. You might be wondering how giving a seal a fish or treat when they do the right thing can end up with the seal performing a leap out of the water? Well, all such behaviors are broken down into tiny little steps we call ‘approximations’. Before we start any new behavior we break it up into smaller steps and introduce all these steps individually and then piece it together at the end. The final demonstration by the seals you see in a show may have taken months, or even years, to learn. The most common question we get asked as trainers, is why we train our seals. The main, and most important, reason is it allows us to provide them with proper care on a daily basis. We call this ‘training for animal husbandry’ or ‘cooperative care’. We can train our seals to do numerous things including opening their mouths, allowing us to brush their teeth, and lying down and rolling over, allowing us to inspect their whole body. We can also train our seals to keep them constantly challenged and stimulated, as well as for research and to demonstrate to our visitors their amazing natural behaviors and abilities. Many humans view seals as a water creature that is fun to look at. They are often amused by their sounds, the way they arch their heads to the sun, and the way they clap their flappers. If you&apos;re wondering how seals know what&apos;s expected of them and when to do, they will be carefully watching their trainers for subtle hand and leg signals, or what we call ‘cues’. The seals quickly learn that every time the trainer presents the cue and the seal carries out the requested behavior, it is rewarded with a fish. 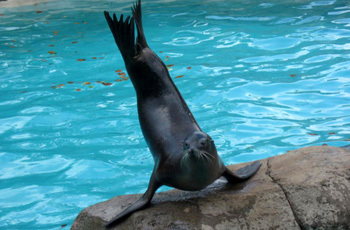 Some cues are quite obvious, such as the trainer waving, which is the cue for the seal to wave. Others are very subtle, such as the trainer taking a slight step to the left, resulting in the seal diving off the rock. Seals are so smart that we can use the same cue on different parts of the stage to mean completely different things. 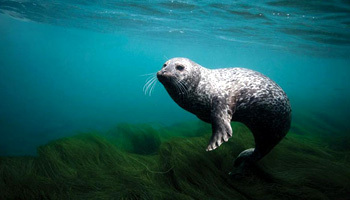 Seals have the capability to extract information on the shape of the seafloor –– known as bathymetry. As a part of seal training, seals diving deep in the ocean for food near Antarctica are helping provide extremely accurate data for use in mapping the seafloor. The new work with elephant seals is the first to extract information on the shape of the seafloor –– known as bathymetry –– from new sensors, glued to the animals heads, which can measure pressure and hence depth. Seals have helped oceanographers before, as scientists have glued sensors to the animals bodies that measures factors like temperature and salinity. As the seals swim, the tags record information every few seconds, then relay it via satellite once the seals surface. About 30 percent of the time seals dive all the way to the bottom to forage for food, so by studying enough dives for each animal –– about 200,000 dives in all –– researchers can create a map of the sea floor. And the seals do it all for a fraction of the cost of traditional seafloor mapping done from ships. Seals have incredible navigation skills Seals are used in the US Navy, for detecting underwater landmines and equipment recovery. Seals (mostly the California sea lion) are used in the US Navy, including detecting underwater landmines and equipment recovery. Sea lions can be highly useful as they can reach places inaccessible to human divers. They can dive to 1,000 feet (304.8 m) and swim silently and up to 25 miles per hour (40 km/h) in short bursts. Seals have been sent in the Persian Gulf to protect U.S. ships from enemy divers. The animals are trained to swim behind divers approaching a ship, and attach a clamp, which is connected to a rope, to the diver&apos;s leg. Navy officials say the seals can get the job done in seconds, and the enemy does not know the clamp was attached to his leg until it is too late. Thus, Seals are the marine darlings that draw crowds of admiring fans to aquariums and beaches.